A Seminole camp with a sleep chickee, cooking chickee, and eating chickee. Photo by Alexander Linn. 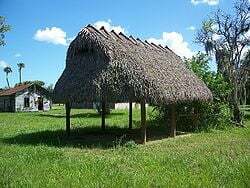 Chikee or Chickee ("house" in the Creek and Mikasuki languages spoken by the Seminoles and Miccosukees) is a shelter supported by posts, with a raised floor, a thatched roof and open sides. The chickee was adopted by Seminoles as an easily erected, disposable shelter that allowed them to move camp frequently and easily when pursued by U.S. troops. Each chickee had its own purpose—cooking, sleeping, and eating—and together they were organized within a camp-type community. Today, the unique structure of the chickee has become popular for tourists. The building of chickees has become a way to retain Florida's heritage and preserve the past while at the same time providing a profitable business for Seminole tribal members. Chickee means "house" in the Creek and Mikasuki languages spoken by the Seminoles and Miccosukees. The Muskogean spelling for chickee is "chiki." Chiki is also the word for house among the Totonacs of Mexico. However, Creeks, who speak the Muskogee language, use the term to describe only a summer house or open-sided residence typical of Florida. Muskogees use the word "chuko" or "choko" to describe a house with solid walls, suitable for occupancy in cold weather. "Choko" is the Puntun and Itza Maya word for "warm" or "hot." It is likely that the word chickee originally applied only to prefabricated houses and over time came to generically mean "house" among Hitchiti-speaking Creek Indians. When some Creek towns moved southward into Florida during the eighteenth century, they used the same word to describe lightly framed houses suitable for a semi-tropical climate. A chickee is a shelter constructed from logs and a steep roof. It is supported by posts, with a raised floor, a thatched roof, and open sides. The traditional chickee was constructed using cypress logs to support the roof, which was then thatched by weaving together palmetto palm leaves with vines or thin ropes. There was also a platform floor, raised about three or four feet above the ground. A ladder was used to climb up to the floor. During rainstorms, tarps made of hide or cloth could be attached to the frame to keep the inside dry. Totonac chikis are residential structures consisting of prefabricated wood frames that are encased in adobe or concrete. 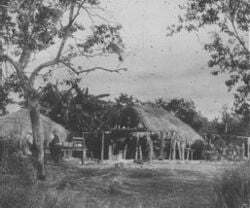 The chickee style of building was adopted by Seminoles during the Seminole Wars as U.S. troops forced them deeper into the Everglades and surrounding territory. Prior to the Second Seminole War, the Seminoles had lived in log cabins often two stories tall with sleeping quarters upstairs. However, due to the necessity of having dwellings that could be erected quickly and easily from local materials, and were disposable, the Seminoles developed the chickee. Each chickee had its own purpose and together they were organized within a camp-type community. Different chickees were used for cooking, sleeping, and eating. There were about eight to ten chickees in one village. In the warm climate of South Florida the chickee did not need walls. However, the raised floor was helpful for protection from insects and snakes, and also kept it dry. They built these structures with long posts so that the chickee would not sink into the marsh or swamp. The steep roof protected the structure from rain. Similar structures, while not referred to as chickees, are present further north, in the Okefenokee National Wildlife Refuge in southern Georgia. They are made from buffalo hides. Totonac chikis consist of prefabricated wood frames encased in adobe or concrete. This same type of prefabricated house, called "post ditch construction" by archaeologists in the United States, first appeared in what is now Georgia around 750 C.E. and became commonplace after the founding of a settlement around 900 C.E., now known as Ocmulgee National Monument in Macon, Georgia. The use of post ditch construction spread outward from Ocmulgee to other areas of the southeastern United States. By 1050 C.E., most houses at the large indigenous community now called Cahokia, Illinois were of post ditch construction. 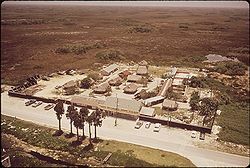 Miccosukee Indian Village, 1972. Fred Ward, Photographer. Although chickees are no longer used for housing, they continue to be used by Native American villages of the Miccosukee in the Everglades. More notably, though, chickees have become popular constructions for tourists and travelers. These structures were originally designed to be efficient and functional in the climate of South Florida, and this continues to be attractive for a variety of uses. For example, some restaurants in Florida use this unique design to attract visitors. Chickees are also used in backcountry areas of Everglades National Park where mangroves or large bodies of water prevent camping on dry land. Made and maintained primarily for backcountry campers, these wooden structures stand several feet above the water and can usually accommodate four to five campers. Some "double chickees" are linked by a walkway and can accommodate eight to ten people. Some upscale homes in southern Florida feature chickee buildings as garden or poolside structures. Chickee construction is now a profitable business for Seminole tribal members. This page was last modified on 11 February 2017, at 15:43.